At any given time, around half the inmates were withdrawing from heroin, making for a dangerous and expensive situation. So they did. Snohomish County in Western Washington is taking a unique approach to tackle the problem. Last year leaders declared the opioid epidemic a life-threatening emergency. The county is now responding to the drug crisis as if it were a natural disaster, the same way they’d mobilize to respond to a landslide or flu pandemic. Snohomish County is the first county in the country to treat it this way. The idea grew out of their experience with another tremendous disaster in the county: the massive 2014 landslide in Oso, Wash., which killed 43 people. Back then, the director of communications for the Sheriff’s office, Shari Ireton, took reporters to see the landslide, and she ended up learning something too. Ireton thought, what if they used that same coordinated system, of everyone working together across government agencies, to tackle the opioid epidemic? County leaders took the idea and ran with it. Now, the response to the opioid epidemic is run out of a special emergency operations center, a lot like during the Oso landslide, where representatives from across local government meet every two weeks, including people in charge of everything from firetrucks to the dump. The technical name for this group is the Multi-Agency Coordination group, or MAC group. It comes straight out of FEMA’s emergency response playbook. They talk through PowerPoint slides and rattle off numbers like 7.5 and 6.1, which refer to items on their to-do list. Seven big, over-arching goals, which include reducing opioid misuse and reducing damage to the community, are broken down into manageable steps, like distributing needle clean-up kits, and a project to train school teachers to recognize trauma and addiction. This to-do list is over one hundred items long. The key is to be realistic, says Ireton, who is also the spokesperson for this group. You are never going to be successful if your goal is just “end the opioid epidemic,” she says. “By breaking it down, it’s like eating an elephant. You just can eat one piece at a time. Breaking it down into a piece that you can actually digest.” Ireton says. In Marysville, Wash., the woods are full of homeless encampments surrounded by piles of spent syringes and trash. On a recent visit, rain drips through a cedar forest next to a strip mall. Officer Mike Buell is visiting the camp along with social worker Lauren Rainbow. Buell cracks jokes with some illegal campers and introduces himself using his first name. 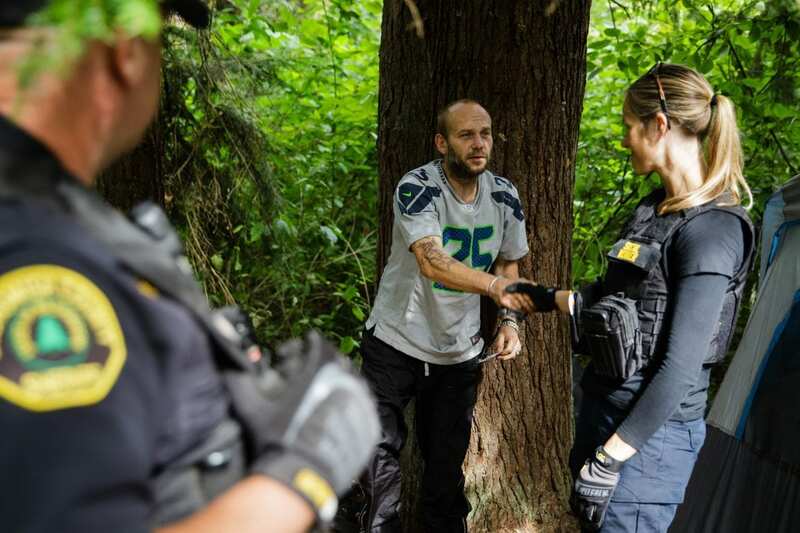 Buell’s job isn’t to arrest the campers, but help them get drug treatment and housing. He crouches next to the opening of one tent and explains he and his colleagues will help the campers with food, coffee and transportation to and from appointments. “We’re basically your Uber,” Buell says. That’s just one item in the county’s plan, and problems with opioids are far from solved here. Snohomish County will keep working on their large and small goals, one bite at a time. This story was reported by Finding Fixes, a podcast about solutions to the opioid epidemic, which is a project of InvestigateWest.